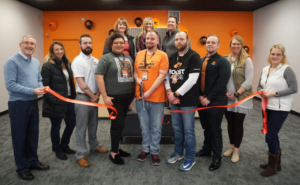 The Wells County Chamber of Commerce staff and Ambassadors held a Ribbon Cutting for Boost Mobile by Bravo Wireless on Friday, January 11, 2019 at their new location 917 N. Main Street in Bluffton. Bravo Wireless officially opened their doors on December 5, 2018. Chris Spencer, Store Manager; Jason Kelley; Gabby Valdez, Sales Advocate; Josh Ames, General Manager; and Zachary Bushong, District Manager were all present from Bravo Wireless to celebrate the occasion. Eight years ago, owners Josh Bravo and Shane Kleine, opened their first cellular store in Indiana, which has now grown to 12 total stores, with Wells County being the newest. Kleine worked in cellular stores for several years and gained experience and knowledge in the industry. Kleine felt that Boost Mobile was going to the be “the next best thing”; therefore, Bravo and Kleine decided to jump in and take advantage of the growth. “We don’t believe in customer service, we believe in guest service because it feels more welcoming and because we’re helping our friends and neighbors and they are not “just” customers to us,” added Chris Spencer, Store Manager.